Influence mapping allows us to identify key stakeholders and the people who influence those stakeholders. This is particularly useful when managing change. Making change happen can be difficult. The larger the change the more difficult it can be to achieve. But even in large organizations, there are usually just a few key people who play a disproportionate role in enabling a change to happen. The purpose of influence mapping is to identify these people. You can then take steps to get their support. This will give you a much greater chance making your change a success. Place the change you’re trying to make happen at the center of your diagram. If you’re trying to get a project to happen then place that at the center, or if your trying to get a proposal approved then place that at the center. The next step is to draw the people with an influence over what you want to achieve onto your diagram. How important to success each person is. You do this by drawing a line between both elements and shading it more, the more important the person is. Which way the influence flows. Use an arrow to do this. For example, if you had no influence over your boss then the arrow would go from them to you. The quality of the relationship. To do this use proximity, so you place good relationships close together and poor ones far away. In this step, we repeat the process adding in people with influence over the people we identified in step 2. The final step is to rank the list of influencers based on a combination of how easy they are to reach and how important they are to the success of your change. 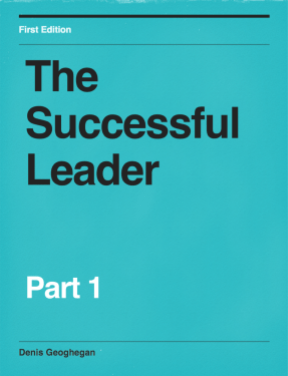 From this, you can generate ways to reach and influence these key people you have identified. This will give you the greatest chance of reaching your goal. 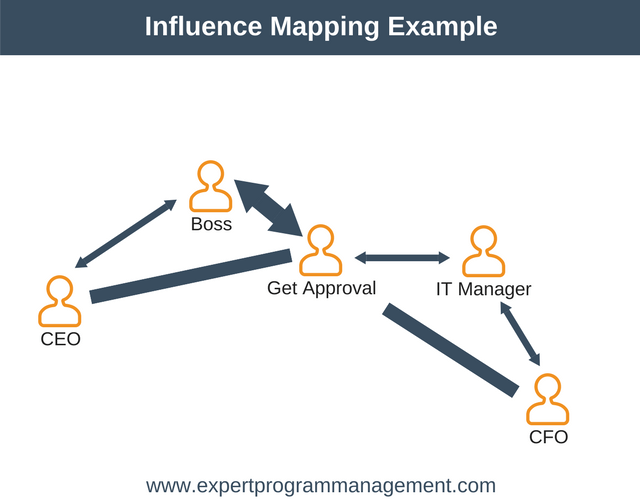 Let’s make this easier to understand by looking at a simple example of influence mapping. In this example, suppose we’re looking for approval to begin a project. The first step is to place the project at the center of the diagram. The Boss: they are really important to getting approval, and we have a good relationship with them. The CEO: they are quite important but we have no relationship with them. But, they get on well with our boss. The CFO: they are somewhat important to the decision, but we generally don’t see eye to eye. The IT Manager: they are not super important to the decision, but we do get on well. He also has some influence over the Finance Manager. Joe: Joe is the IT architect. No decision gets approved without the CEO first getting technical approval from Joe. Fortunately, we have a great relationship with him. Jane: Jane is Head of Human Resources. We get on okay but she gets on great with the Finance Director. which actors are important to the decision, because of the thickness of the link. How strong the relationship is based on how close actors are to each other in the diagram. Which way influence flows. The direction of the arrows tells us this. We chat to the Boss to ensure they are onside with the proposal. In this meeting, the Boss agrees to run the idea behind the proposal past the CEO. The purpose of this is to sound out the CEO before the proposal is presented to them. We talk with Joe to ensure he thinks the idea is practical, and adjust the proposal based on his feedback. We also learn from Joe that the CEO isn’t interested in lots of detail and prefers to be sold on the “big idea” before seeing the detailed figures. To win over the CFO we talk to the IT Manager. From this conversation, we learn that the CFO likes to go over the figures in detail before committing to a new proposal. Because of this, we decide to book a series to meetings with the CFO before presenting the proposal to help get the figures to a position where the CFO is happy with them. Because influence maps can get complex quite quickly when you’re creating them, it is a good idea to use post-it notes or use a whiteboard so you can make alterations easily to your workings. There are also commercial influence mapping tools available. 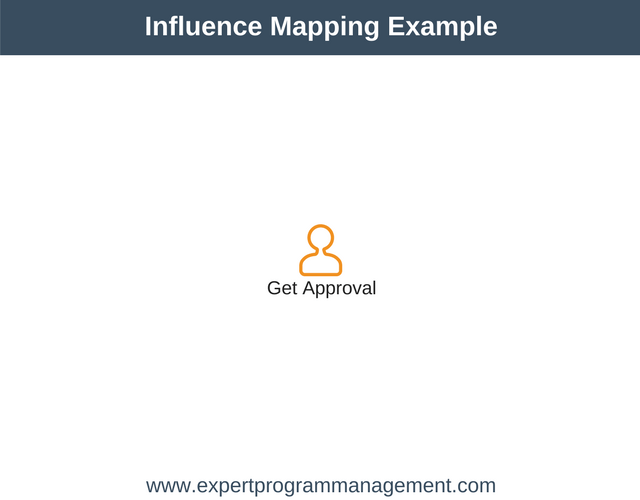 Influence mapping allows us to identify the stakeholders who are central to a decision. More than this, it allows us to identify other actors who have influence over these key stakeholders. 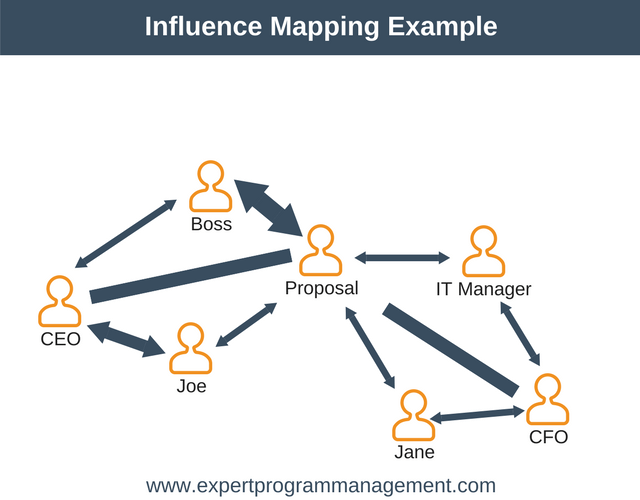 Influence mapping can help you to identify these key influencers. From there, you can create a plan to work with these key influencers (where you can reach them) to push your agenda. This will give you a much greater chance of success, whatever the change you are trying to make happen.